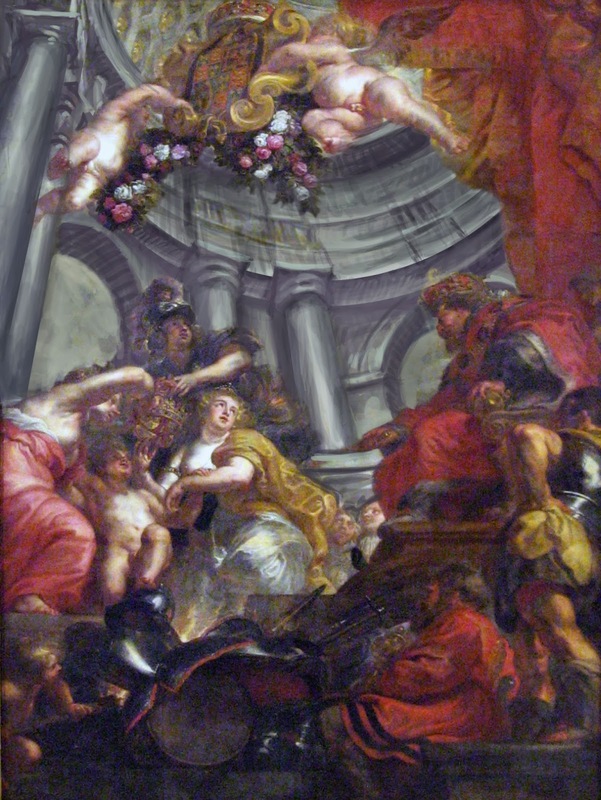 Rubens painted a set of massive canvases (including two measuring 28 x 20 feet and two others at 40 x 10 feet) for the ceiling of the Banqueting House at Whitehall in 1630. 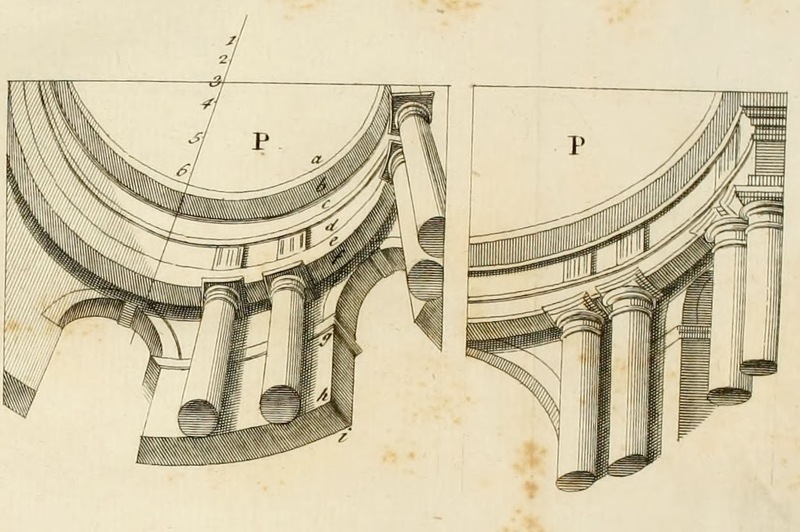 Despite boasting to his customer, James I, that he was “by natural instinct better fitted to execute very large works than small curiosities,” he seems to have made a bit of a mess of the linear perspective. 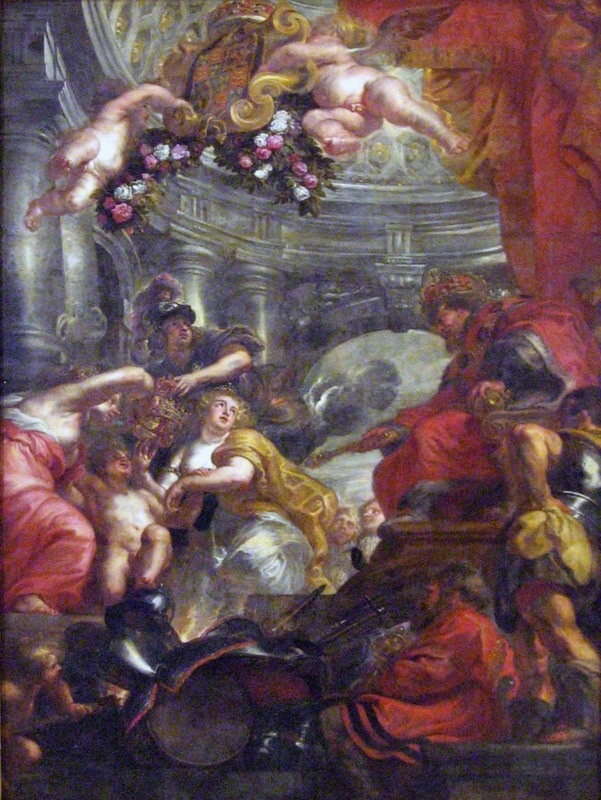 In one of the panels (above), the seated figure of the King, his retinue and even the putti floating above with the royal coat of arms, are all painted as you would expect in di sotto in su painting; they're all foreshortened from below. The columns, however, are parallel to the picture plane which is incorrect. 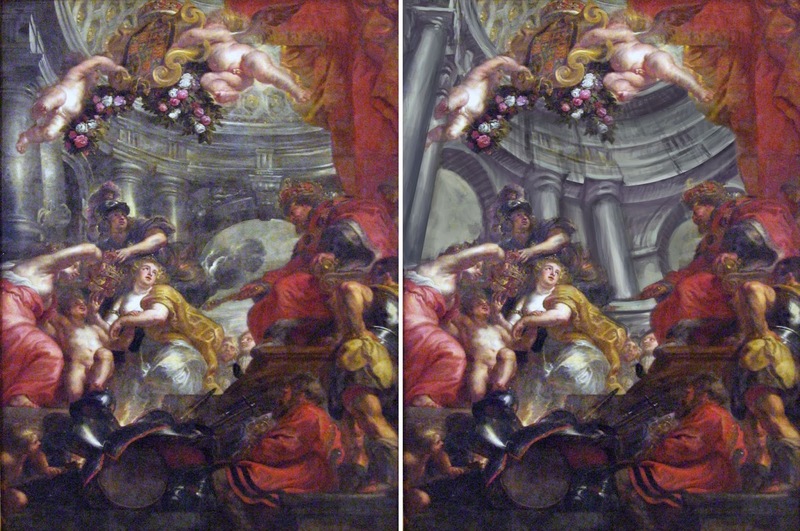 I took the liberty of sketching on top of Rubens painting (below) using the correct viewpoint (according to linear perspective, at least), such that the columns and the figures appear to recede towards the same - singular - vanishing point. This discrepancy in Rubens' paintings was first noted by 18th century painter James Highmore, who published his "Critical Examination of paintings on the Ceiling at the banqueting-Hall at Whitehall," in 1754. Below, on the right, is the row of columns as Rubens painted them, and to the left appears Highmore's engraving of the corrected view. Highmore points out that Rubens used up to three (!) vanishing points in each of the panels. Why? We'll never know. Certainly, he wasn't especially used to painting on ceilings. I leave it up to the viewer to decide which version of the scene is the better view. Here they are again, side by side for easier comparison.